As a vegetarian, I sometimes find it difficult to get enough protein into my diet. On average I was getting around 20 grams of protein per day by eating what I thought were high protein foods: mostly beans, lentils and nuts. I went to see a nutritionist and she said, “Girl, you are protein starved!” Everything else in my diet was great. I eat mostly whole, organic foods. But, I have been vegetarian for about five years now and have been a bit more tired than normal of late. So, the nutritionist asked me to keep a food diary for two weeks and her recommendation was to eat more protein. She also shared that it takes about a cup of beans to equal the protein in 1 ounce of meat!! Who knew?!? So unless I plan to eat 4-6 cups of beans each day, I need to look at some other sources in my diet. The truth is most meat-loving Americans eat way more protein than they need to. However, miseducated vegetarians, such as myself, maybe missing the boat. According to the Center for Disease Control (CDC), adult men need 56 grams of protein per day and women need 46. As I mentioned above, I was getting about half of what I needed. No wonder I was tired!! So I started doing research to find good ways to add more protein to my diet. This all happened at the same time that I was researching reducing my sugar intake and my supplements (an unregulated industry that was costing me hundreds of dollars a month to participate in, not to mention that I felt like a druggy popping all those pills! Do not get me started… STOP THE MADNESS). I discovered Dr Mark Hyman who is an expert in nutrition and has become a nutrition rock star of sorts thanks to his published books and recent feature in the new movie Fed Up about why sugar is evil. He drinks a good protein shake every morning that has less sugar and more protein with whole foods vs. the average smoothie you might drink. It is also packed with nutrients without any protein or whey powders which was a HUGE selling point for me who is trying hard to eat less processed foods. So, without further ado, here is the low sugar, high protein easy peasy breakfast shake that I now drink every single morning. I have more energy and before noon, I am already half way to my protein goal for the day! Combine all the ingredients in a blender and blend on high speed until smooth and creamy. While not essential, it can help to add the ingredients to the blender in this order: water, nuts and seeds, powders and spices, leaves and herbs, fruits, yogurt, and heavier stuff last (in other words, add by weight from light to heavy). Lastly, add more water if you want it thinner or less if you prefer a thicker shake). Recipe serves 1. FYI – I double this for my husband and I and it makes two pint size glasses. With the addition of the yogurt, this recipe serves up about 20 grams of protein!! A documentary film was recently released called Fed Up. It shares the good, the bad and the ugly about sugar. It also showcases how it has taken over our American diets and what we can do to take back the control over our sugar intake. Here is the trailer for the film so you can start to learn more. What is your secret to adding more diet to your vegetarian diet? Do you have any good protein shakes to share? How many grams of protein are in the shake? Sugar? Kathy, we plugged in the ingredients into the USDA’s Super Tracker and according to their calculations it has 33 grams of protein and 38 grams of sugar (that is with the optional ingredients, all raw/fresh produce and using low fat yogurt). Hope that helps! 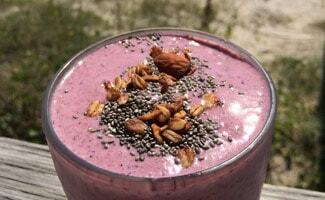 We enjoy this smoothie almost every morning, great recipe! We typically change up the ingredients and don’t use all of them. My favorite is to add banana 🙂 And cocoa and peanut butter is also a hit, a nice change up from the fruits and veggies. I love banana smoothies too but that’s a great idea to add cocoa and peanut butter – thanks for sharing!